With the growing popularity of mobile technologies and the increasing use of groups within organizations, it is important to understand the collaboration contexts where mobile collaboration technologies (MCTs) are essential. This is especially critical given the high cost associated with the acquisition and implementation of MCTs and the need to make an informed decision regarding the appropriateness of MCTs. 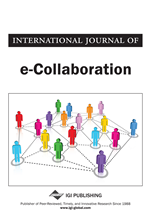 In this paper, the authors address this issue by first drawing on real life-based collaboration scenarios and examining the technology requirements of groups; second, comparing the features offered by MCTs with those of FTF and two types of CMCTs; third, proposing a collaboration environment-technology fit perspective in realizing optimal usage of a collaboration technology; and fourth, creating the Group Collaboration Technology Repertoire Grid, which maps the “ideal” collaboration technology(s) repertoire for each type of collaboration environment. The grid highlights the collaboration environments that would need MCTs and provides managers or organizational group leaders the ability to map their collaboration environments into a specific category and thus more easily decide on the particular collaboration technology repertoire that would be most beneficial. It is a well acknowledged fact that there is an increasing use of groups in organizations for performing key tasks (Jehn & Mannix, 2001). Dahlbom and Ljungberg (1998, p. 229), for example, argue that “most work in the modern company is cooperative.” They further state that “today’s project and team-based organizations are designed to promote cooperation,” and that such “cooperation leads to increased use of IT that bridges distance, such as email, but it also leads to mobility; people travel to meet physically.” Consequently, the landscape of organizational collaboration has changed significantly over the last few years. In the mid-eighties, collaboration was traditionally viewed as a co-located activity, where connectivity between the collaborative members was provided by either face-to-face contact or through the use of simple, same-time, same-place group support systems (e.g., DeSanctis & Gallupe, 1987). The mid-nineties witnessed the surge in virtual collaboration where connectivity was provided between members who were dispersed both geographically and (or) culturally (e.g., Jarvenpaa & Leidner, 1999). Currently, we are in the era of “spontaneous collaboration” (Esbjrnsson & Ostergren, 2002), which demands ad-hoc connectivity, or connectivity between members while in a state of mobility. Spontaneous collaboration may be defined as a type of collaboration where “human and/or computational participants coincide temporarily at a location and interoperate to satisfy immediate needs [or goals]” (Esbjrnsson & Ostergren, 2002, p. 1). What it suggests is that modern day collaboration involves members that are in a constant state of mobility, who are working together under time pressure to meet dynamic and emerging goals. While organizational collaboration has been increasing, and going through changes, the use of mobile technologies are also becoming increasingly popular in travel, education, stock trading, military, and medical emergency care (e.g., Malladi & Agrawal, 2002). In fact, recent statistics highlight that there are about 2.7 billion mobile phone users in the world (Dai & Palvia, 2009). With mobile phones moving away from being a simple “voice communication device” to offering “voice, text,… web surfing, digital imaging, entertainment,” among others (Dai & Palvia, 2009, p. 44), companies are also investing heavily in to mobile technologies to further enable their employees, and create competitive advantages. Lyytinen and Yoo (2002) argue that there is a “changing landscape of organizational computing” as well, with increasing dependency on mobile computing and computing “available anywhere, at any time” (Lyytinen & Yoo, 2002). Given the increase in collaboration within organizations and the developments in mobile technologies, it is believed that access to several collaboration-related features such as email, shared calendars and databases through one’s mobile devices is now a necessity (Karren, 2007). Consequently, on the technological front, several different companies (e.g., Novell) have launched variations of their traditional collaboration tools on mobile platforms (e.g., Karren, 2007), and we are beginning to see a Peer-to-Peer groupware that can provide ad-hoc or mobile connectivity such that workers can now collaborate even when they are “away from their desktop and laptop and still feel ‘plugged in’ and responsive” (Karren, 2007, p. 2).